Great makeup application begins with a flawless canvas and smooth, beautiful-looking skin can be created with just the right foundation. 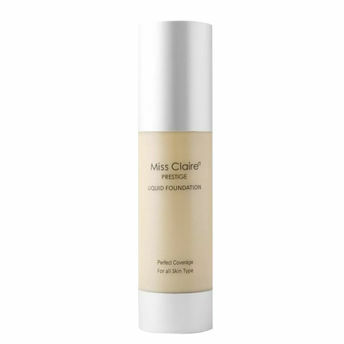 Designed for all skin types, this Miss Claire Prestige Liquid Foundation Perfect Coverage is formulated using high-quality ingredients that won't irritate skin, while providing a perfect base for makeup. Effective moisturizing agents keep the skin supple and hydrated, allowing for long-lasting wear that doesn't feel cakey or heavy. Explore the entire range of Foundation available on Nykaa. Shop more Miss Claire products here.You can browse through the complete world of Miss Claire Foundation .Alternatively, you can also find many more products from the Miss Claire Prestige Liquid Foundation Perfect Coverage range.